Dora and Boots warn their friends of an approaching storm cloud. Dora and Boots find a magic stick. 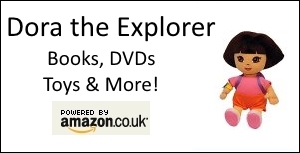 Dora and Boots help the jigsaw puzzle wizard, El Encantador, find his missing magic wand. Dora and Boots join Rojo, the red firetruck, on his first mission to save a little kitten stuck in a tree. Dora and Boots head to the Gooey Geyser to save Boots’ squeaky bath toy. Dora and Boots, along with their trusty friends Backpack and Map, need to help Benny, who is sick. Dora and Boots gather the missing ingredients for a Mother’s Day cake. A somewhat stupid bird mistakes Map for a stick and it’s up to Dora and Boots to rescue their friend. Dora and Boots are a cowboy and cowgirl who ride their trusty friend Pinto the pony across the wild west to deliver the Cowboy Cookies to Benny. Dora and Boots need to collect ten yellow tickets at the carnival to win the big prize: a big pinata that contains a surprise. Dora and Boots try to find all the things that make the Grumpy Old Troll not so grumpy. Map finds a magic cape that gives him superpowers. Now, using his new superpowers, Map must lead Dora and Boots to Dora’s house so her father can show her a surprise! With her new camera, Dora and Boots snap photos for a contest. Boots’s toy firetruck gets lost on the top of the Snow Mountain so Dora and Boots, along with their friend Tico needs to get it back before Swiper does. Dora and Boots head to the North Pole to deliver a present to Santa Claus. Dora and Boots deliver a letter to Swiper when the Delivery Bird accidentally breaks her glasses. Along the way, they deliver letters to their friends that contain different surprises. Dora and Boots lead a parade to free musical instruments that were locked up by Senor Shush, who doesn’t allow music in his village. Dora and Boots hunt for cascarones – Easter eggs with confetti and prizes. Dora and Boots need to stop Swiper from stealing Isa’s cupcakes. Dora has a secret; she never conquered the monkey bars. If she wants to retry it, she and Boots need to race over to the Play Park. Dora plays a competitive game of hide and seek with her friends in order to win a trophy. Dora and Boots search for Mimo, the school’s hamster, when he goes missing. Dora and Boots rescue a baby duckling that has magically come to life in their coloring book. Dora and Boots go to someone’s birthday party after following a mysterious birthday balloon. Dora and Boots teavel to the Lost City, where they hope find Dora’s missing teddy bear and nearly everybody’s other favorite things. Dora and Boots help Leon the circus lion, who has an unusual talent of juggling and uncycling, to join the circus.